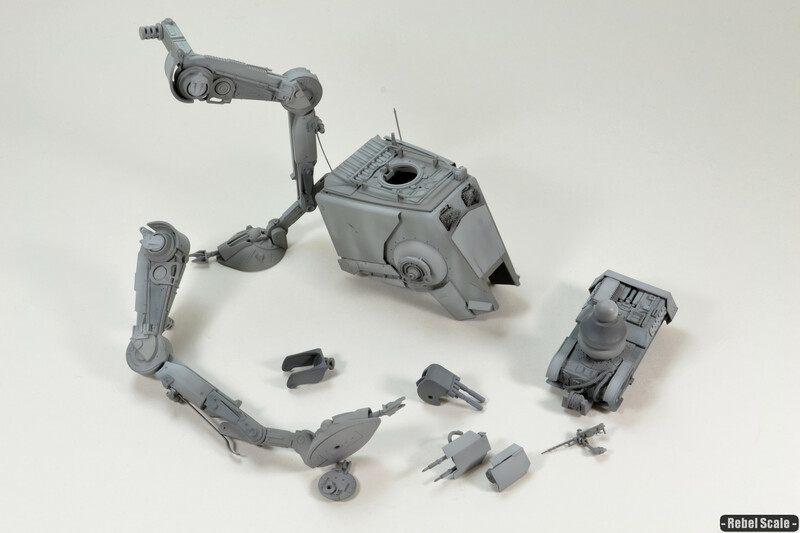 Bandai AT-ST All Terrain Scout Transport build steps. 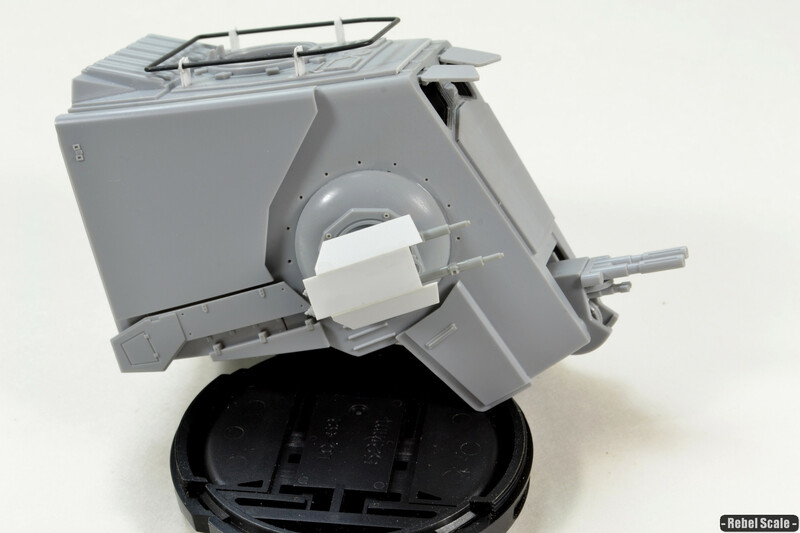 I am modifying the design to fit Kai Lim's artwork: Walker Assault. 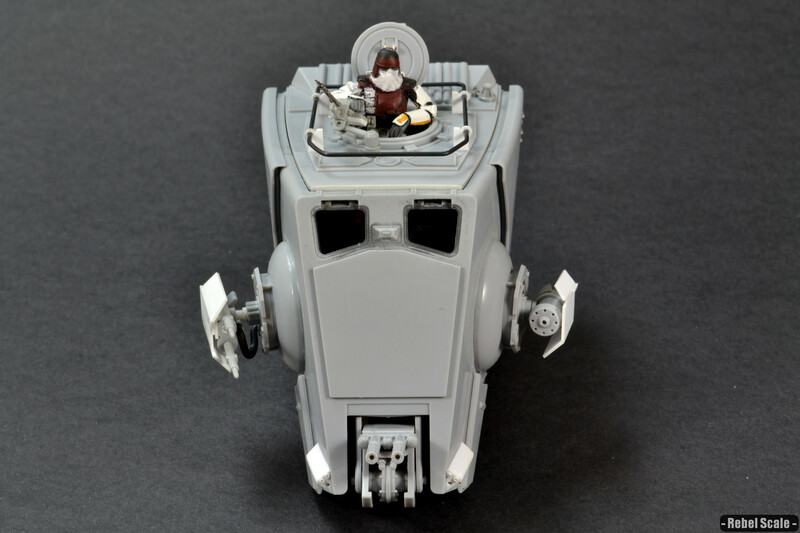 Among the modifications is a Snowtrooper commander, roof blaster turret, swapped side turrets with new armor shields, modified side blaster turret with 2 large barrels and power cable, triangular terrain scanners on either side of the chin, a roof-mounted spot light, and what looks like a winch under the chin. 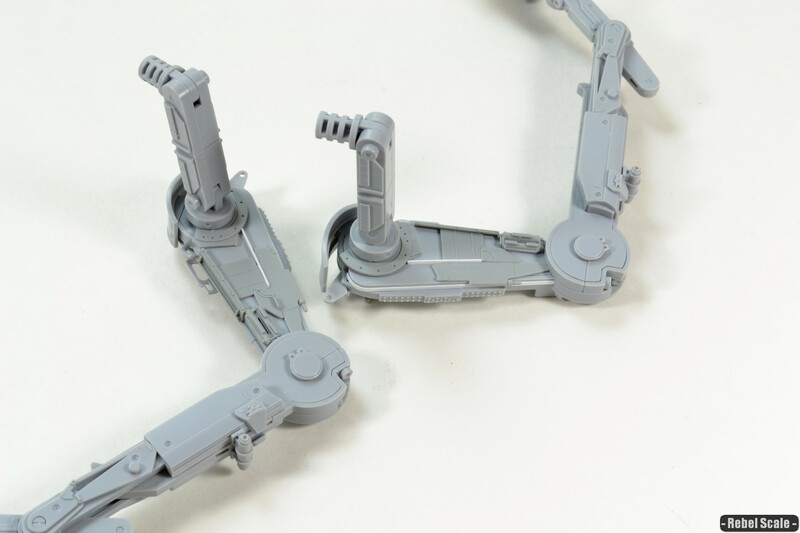 To start, let's look at how to make the legs fully articulated. Now, they do articulate quite a bit, but it isn't hard to alter them to be fully poseable. 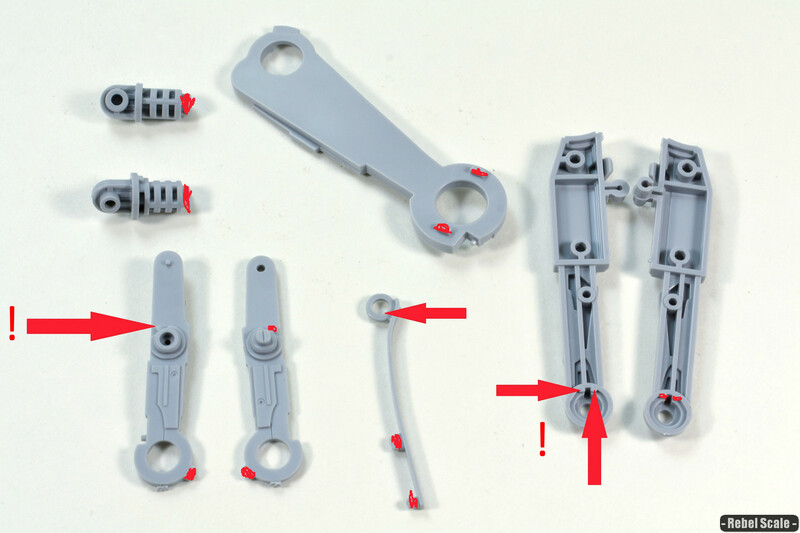 Here are the parts that have areas you need to remove (highlighted in red). However, the upper ankle joint is really weak. So, if you remove the areas marked with a (! ), you'll have to glue it once you get the position you want. For other notes, part C1 36 is optional. It obscures detail underneath and isn't shown in any other pics in the instructions. You can see the rectangular hole here (the one with the semi-circle). BTW: you can technically add it after the other construction, but you couldn't remove it without removing other parts. You should be left with something that can fully articulate. The tension strip at the back of the shin is made of a vinyl-plastic, and can break. 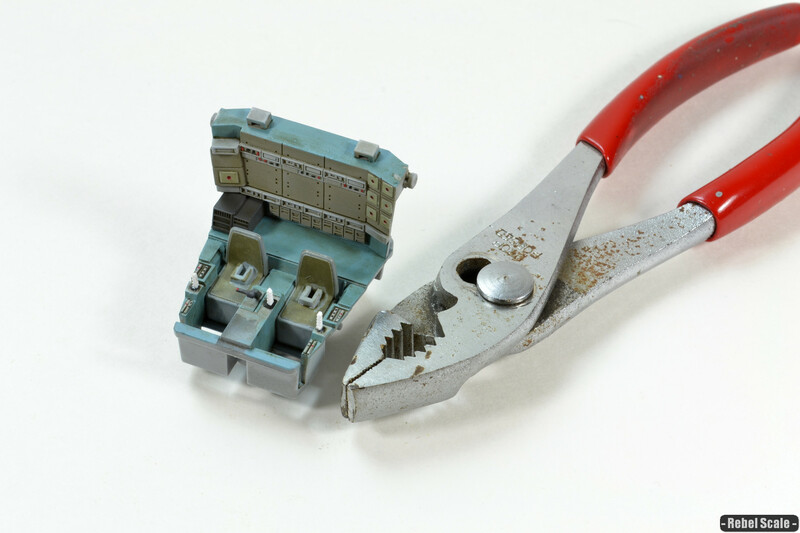 You may elect to cut the "loop" off the tensioner strip instead of the 2 tabs. 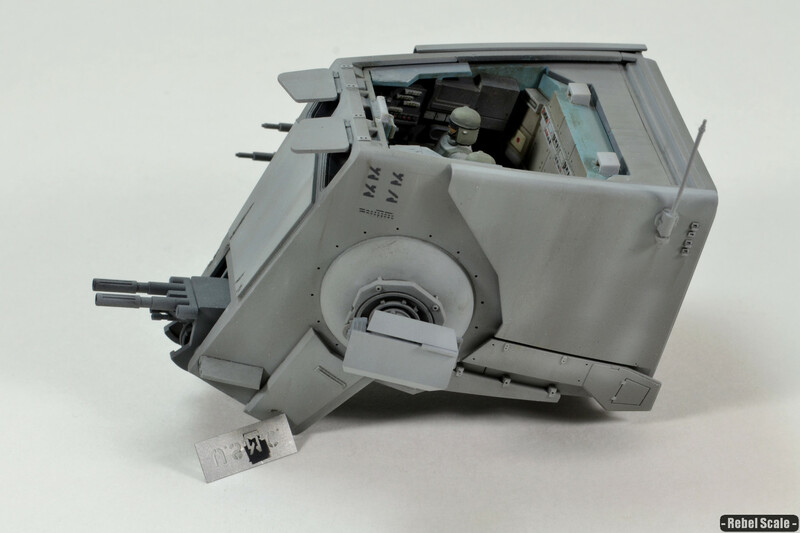 You can position the hatch to open on the side or in the back. 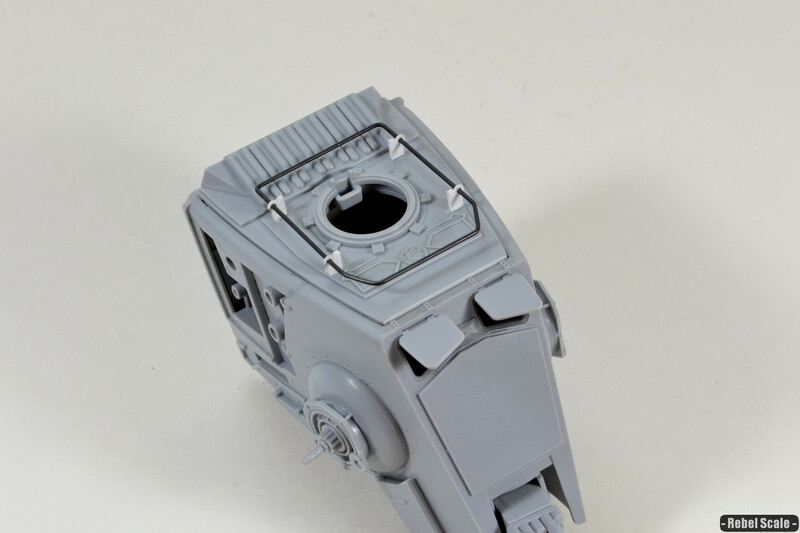 Chewie only works with the rear opening hatch, but some of the models had a side opening hatch...so you can choose. Showing the optional side-opening hatch. For this version, I opted for the rear-opening option. There's also a lot of detail hidden by the rear radiator thingy. 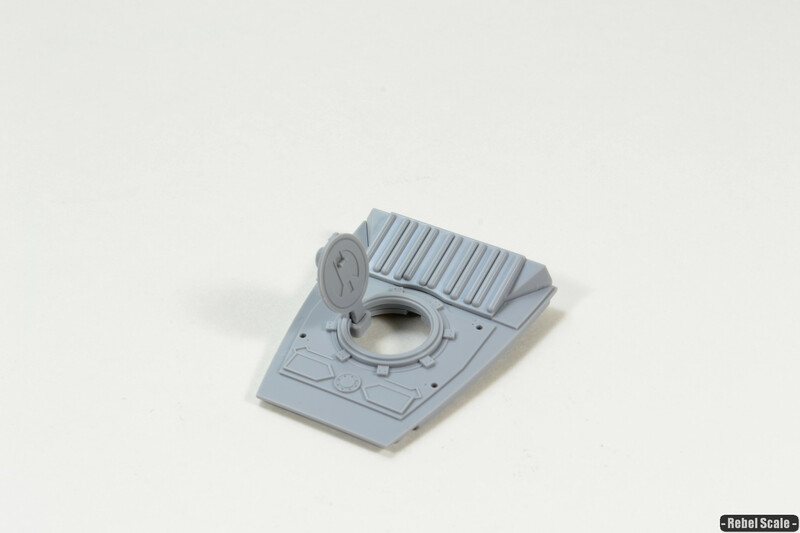 That little piece fits over all that detail at the back of the cabin roof. But I've seen no photos that show the walker without that piece there. 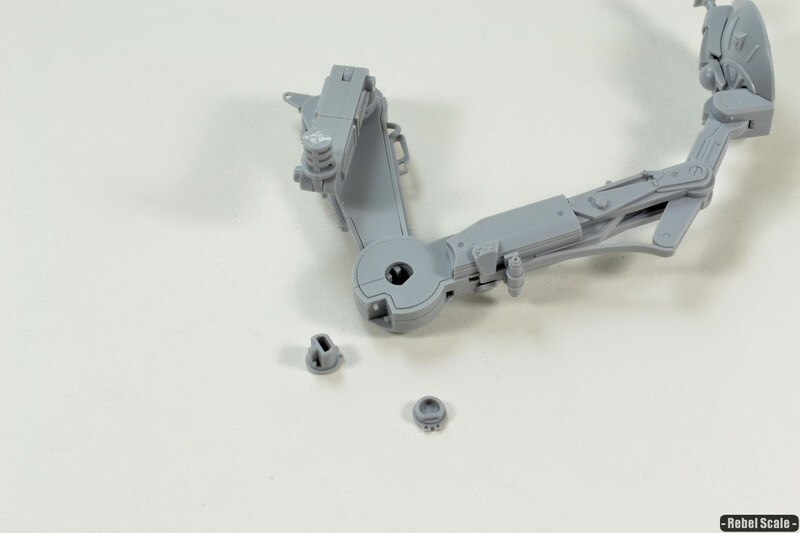 And finally, you have a choice of joints for the upper legs. 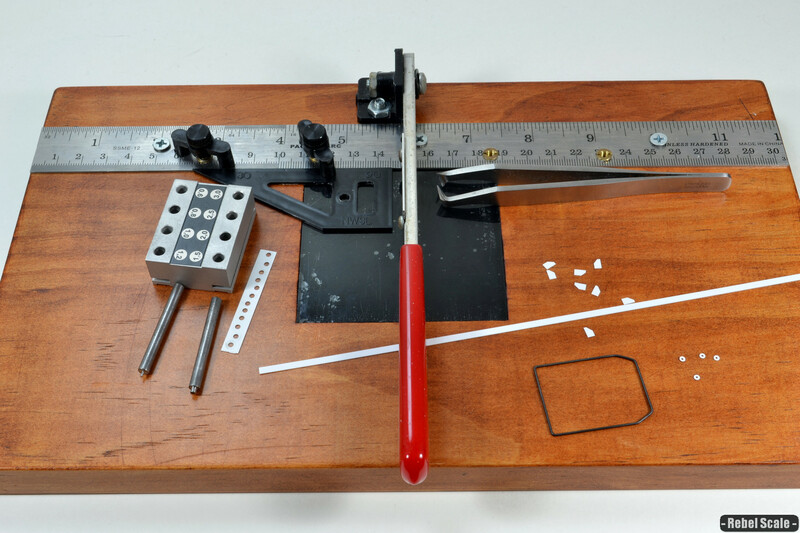 The larger piece locks the joints together. Now, unless you are dropping in nose weights, the snap pieces are strong enough to hold whatever position you put the legs in. I may look at modifying the larger piece to add more strength to the joint, but it's mostly unnecessary. Replaced the molded-on hoses with styrene rod. Adding these was easy, but cutting out the molded bits was a pain. Next up: replacing the vinyl-plastic tension bars with brass strips roughly 5.4 cm long. I haven't added the bend yet, but I will. I'm also pointing out some seams that you may need to fill. 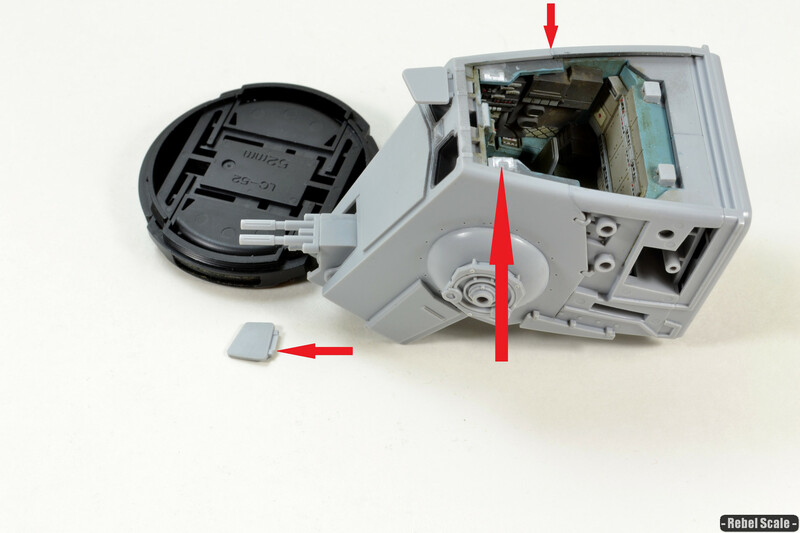 The upper two seams were easily fixed with a little Tamiya extra thin. The seam on the feet is a little more pronounced. I added a throttle to replace the molded on one in the cockpit. 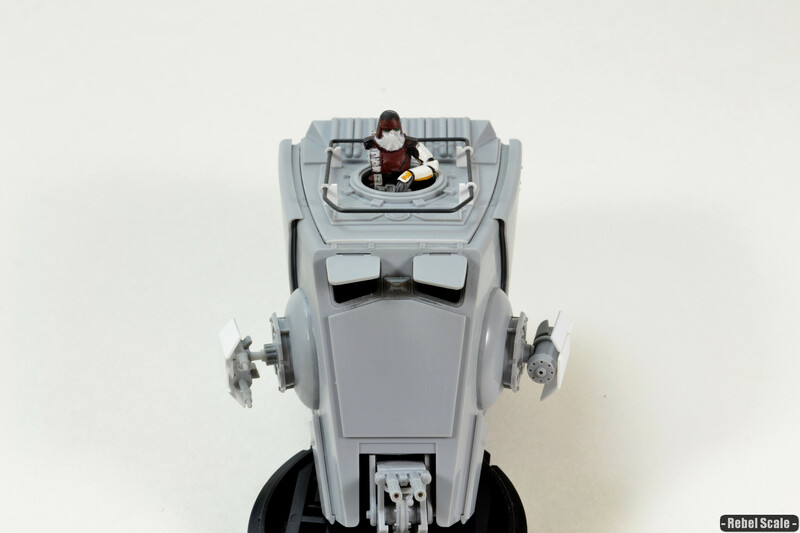 Honestly, I can't think of any other detail to add in the cockpit. Even comparing the Incredible Cross-Sections drawings, this kit has it all there. Also, I drilled out some of the rivets on the model, particularly the ones around the side weapons. A .4 mm drill bit was perfect at adding a little more depth. I took the brass strips and bent them to make the leg tensioners. I also took a bit of brass rod (.81mm), and I bent it to replace the bar around the top hatch. I had to solder the ends together at the back of the bar...but it's barely noticeable. I also took the time to try out my new AK Brass Burnishing fluid. I thinned it half and half with water and submerged the parts for about 10 minutes resulting in a nice dark patina on the parts. I worked on the legs, adding some detail to the inner panels. Granted, there wasn't anything on the studio models, but it just looked too blank for me. I also started painting the cockpit......blue. Yes, blue. I was inspired by Soviet jet interiors (particularly the Sukhoi jets) and used a greenish-blue. I painted the other details as well, which took a bit of work and rework. I then added a brown filter. I also had knocked off one of the joysticks. In my attempt to remake the missing one, I found a neat way of creating those ribbed control sticks. I took styrene rod and clamped it with my pliers. The result was a thin joystick with rippled texture you see on a lot of vehicles. Finally, I added more weathering...mostly mud/dirt via pigments and enamel products. You can see the blue has toned down a lot. I glued the cockpit together today, at least the major parts (sans the top). 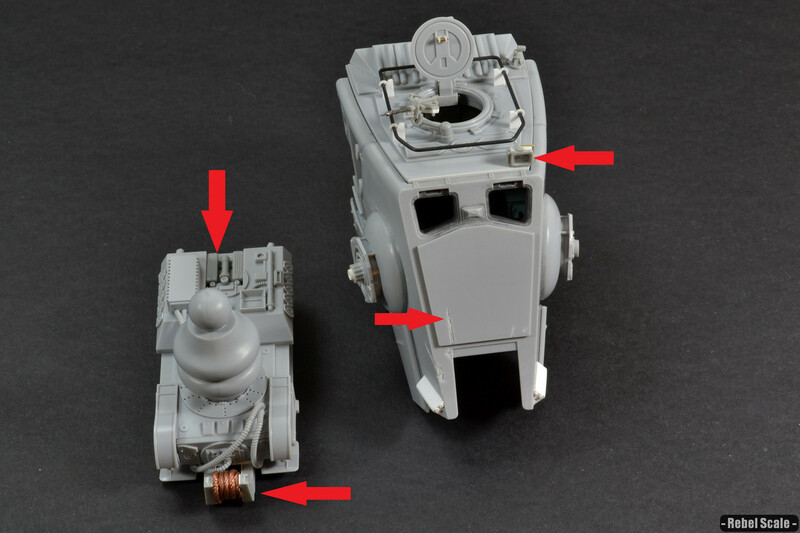 A few notes: If you remove the mounting points the big arrow is pointing to, then there's less of a gap between the roof and the front (Scott Girvan pointed this out on SMA). One small seam on either side to fill in. 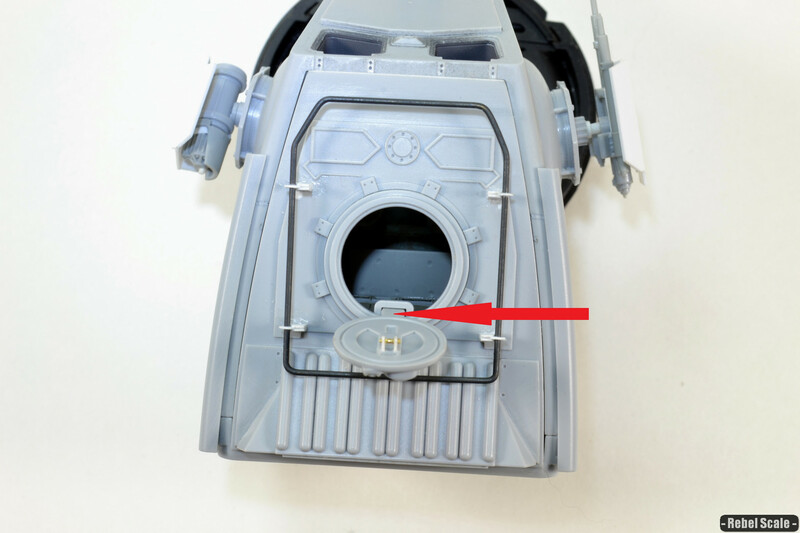 And if you remove the mounting plate of the visors (remove the plastic down to the notched rectangle in the pic), you can position them at almost any angle. They pop off easier, but they can stay in place without glue. You can see the gap is still there, but not as prominent. Plus, I want to be able to remove the roof. Also used 1.1mm rod and putty to cover the mounting holes for the handrail. And I drilled out some more rivets on the roof. You can see the new position of the modified visor. 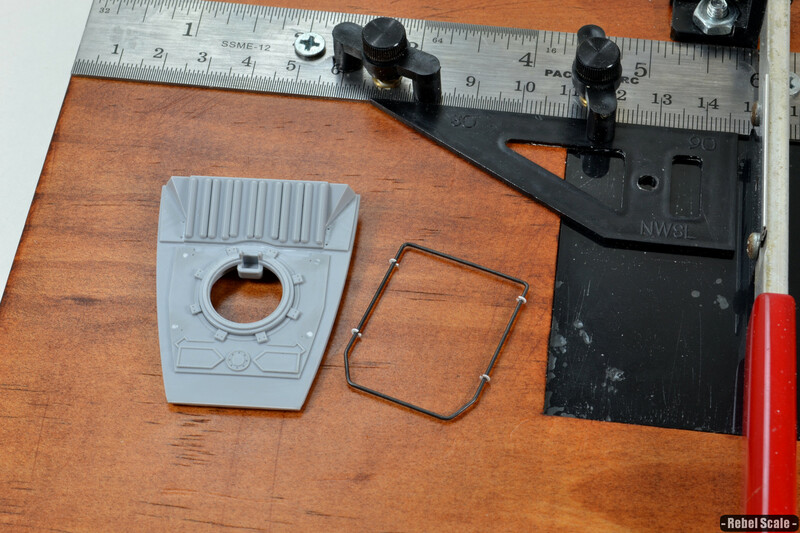 All you need to do is cut off the back part of the mounting tab. Minor update. I added a thin strip (and then sanded it even thinner) to the front of the roof to close the gap. The side gaps are still there, but I want the roof removable, so those gaps will stay. If I do another, I think I could add the strips to the cabin walls, and then sand the roof to fit (might be a better option). Also, I drilled out the rivets along the front of the roof (.3 mm drill bit or smallest available). Using my punch set, I punched .8mm holes into thin styrene strips (.8mm being the diameter of the brass rod used for the handrail). 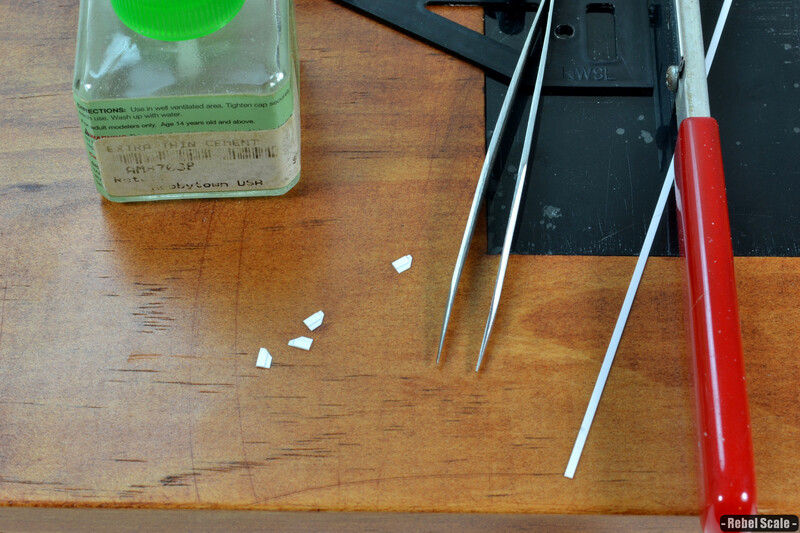 I then aligned the strip and punched 2mm holes centered over the other holes, which created 4 little donuts. Now, I had to do this many times to get 4 that were near perfect. Using my modified Chopper, I cut 2.5mm width (Evergreen 105) strips into 8 4mm planks. These were hand-cut again to create an angled edge. I used the flush-cutters to cut the angle, using one piece as a guide for the others. Using 1.5mm strips (Evergreen 103), I cut 3mm planks and glued them to the inside of the larger planks. I would then sandwich them using the other planks. Here you can see the finished sections. I also cut out little divets into the circles. The idea here is that I would slip the circles onto the brass rod, then cement the circles to the angled support pieces. Here you can see the circles attached to the handrail. The cut out would slip into the angled parts and be cemented in place. Finally, here is the end result. I think I would have been better off gluing the angled supports on the roof, then attaching the handrail. But it worked pretty well my way. I took some liberties granted, but I think it looks pretty Imperialistic. I will go back and CA glue the handrail to the circles, but only after I'm sure of the position I want. I combined a WotC Galactic Marine, Clone Commander for arms, and a Snowtrooper for the backpack. Then I added some detail to the backpack and chest armor. I also found 1/35 bare hands are pretty close to 1/48 gloved hands (after filing down the fingers a bit). The wrist armor piece also aids in making the scale look "right". 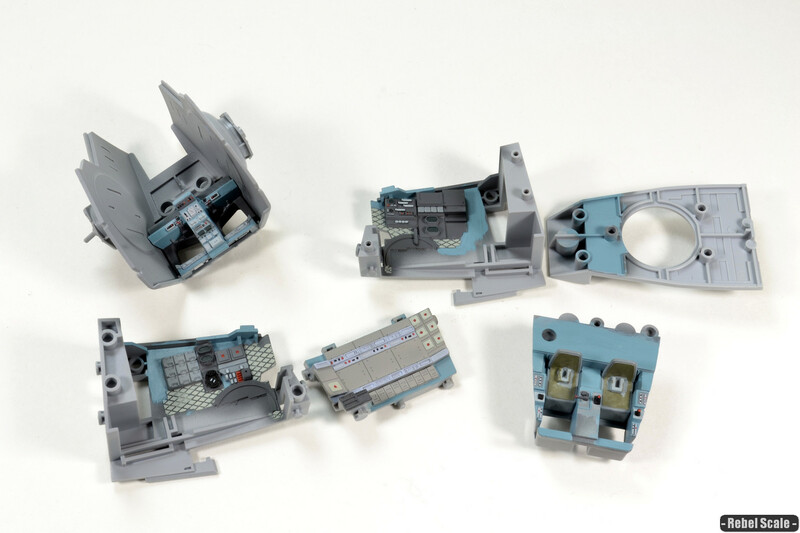 Here are the finished weapon turrets (sorry, the gun shields are difficult to see in the white background). Each has new parts, and the blaster turret is almost completely revamped. 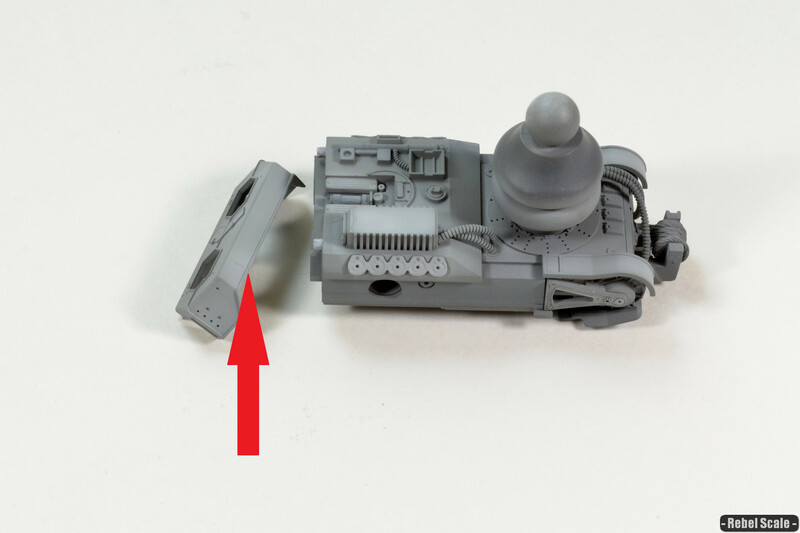 I also ditched the vinyl-like support rod for the blaster turret and rebuilt one using 1.6mm rod. 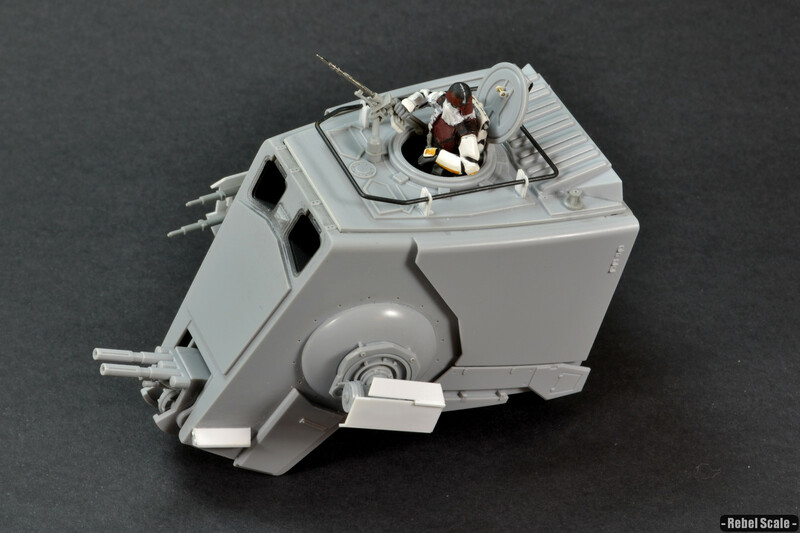 I still have to add the dangling hose for the blaster turret, and I may add some more small details. Side view of the concussion grenade launcher. I scratched some gun shields inspired by what I thought would make cool TIE wings. 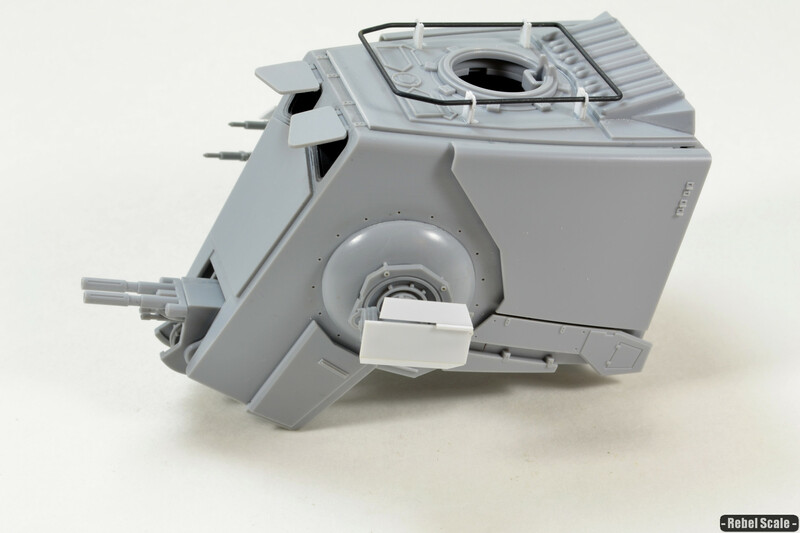 Side view of the dual blaster turret. Again, it features another neat gun shield inspired by TIE's. 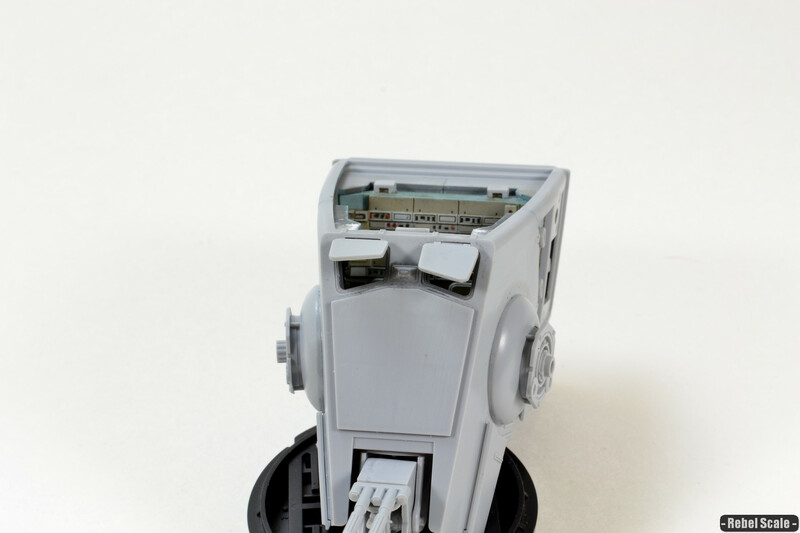 Here is the trooper with one arm glued in place, as well as the turrets in place. 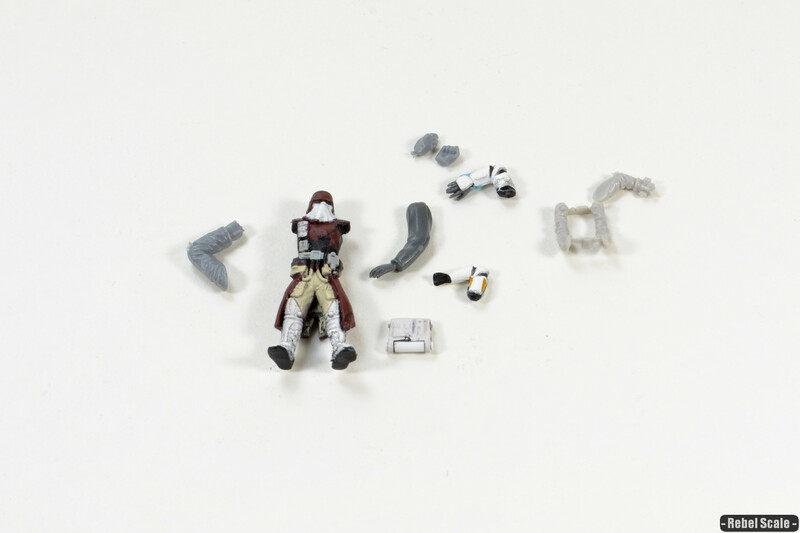 The trooper will be leaning on his left arm with his right arm leaning on a small blaster turret that I have yet to finish. I also added a step inside the hatch to boost the figure high enough to see him. Without the "booster seat", only his head and shoulders were visible. I did make a new inner handle for the hatch. Also, note there is a small injection pin mark where the arrow is (I've already sanded it down). 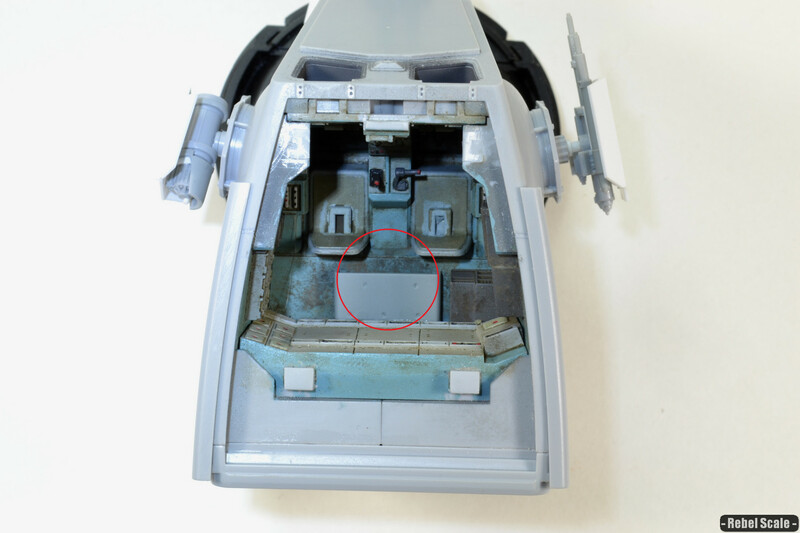 You can see where the hatch opens (red circle), as well as the "booster seat" I added. 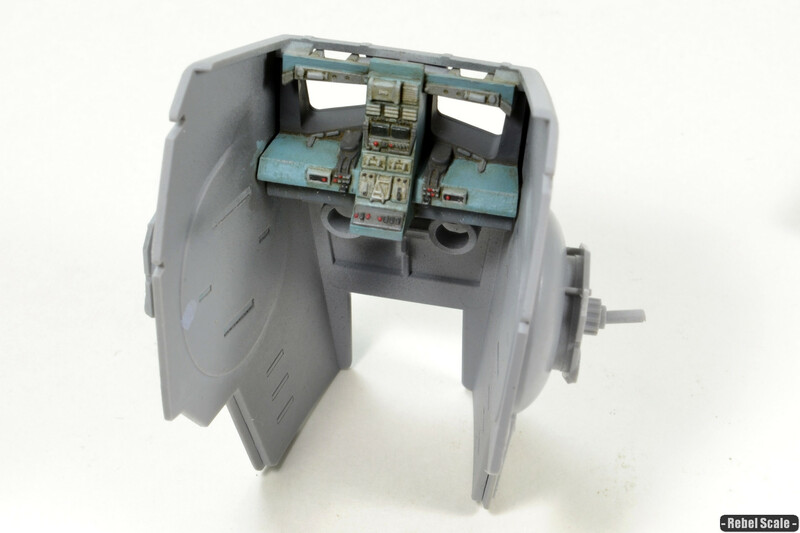 The 1/1 cockpit set they made for the interior shots didn't have a hatch or anything external, which is why you don't see any handrails behind the pilots. But it would make sense to have something more than just a wall of lights and switches. I've finished the figure (sans painting). I posed the arms and hands to make him look like he's leaning on his left while laying his right arm on the gun. 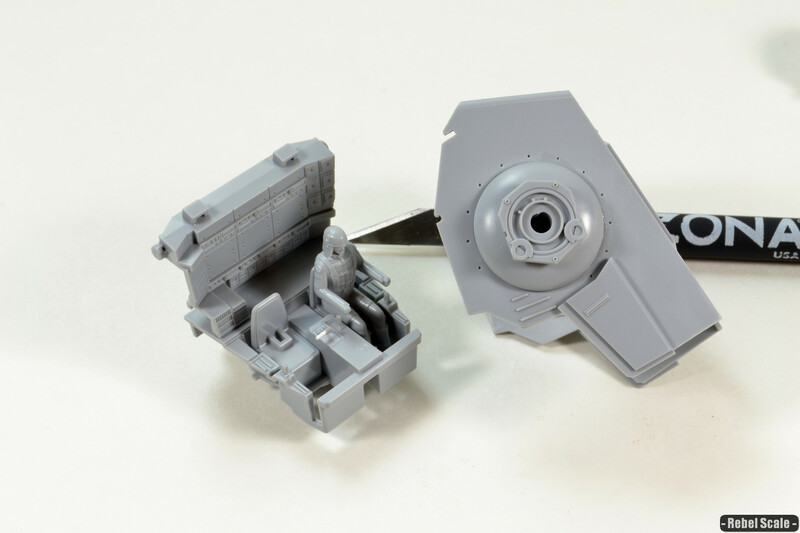 Speaking of, I made a blaster roof turret out of watch parts and the main barrel from a 1/72 sd.kfz 222 kit. It's fully poseable, positioned on a ball hinge. 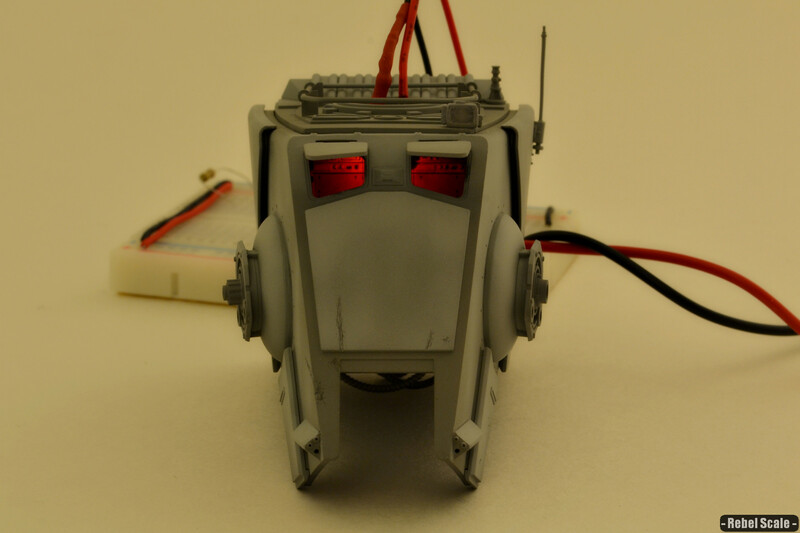 Finally, I added the little triangular sensor things to each side of the chin. I had to use a punch for the .8mm discs, which I then drilled .35 mm holes into. Yeah....friggin tiny. 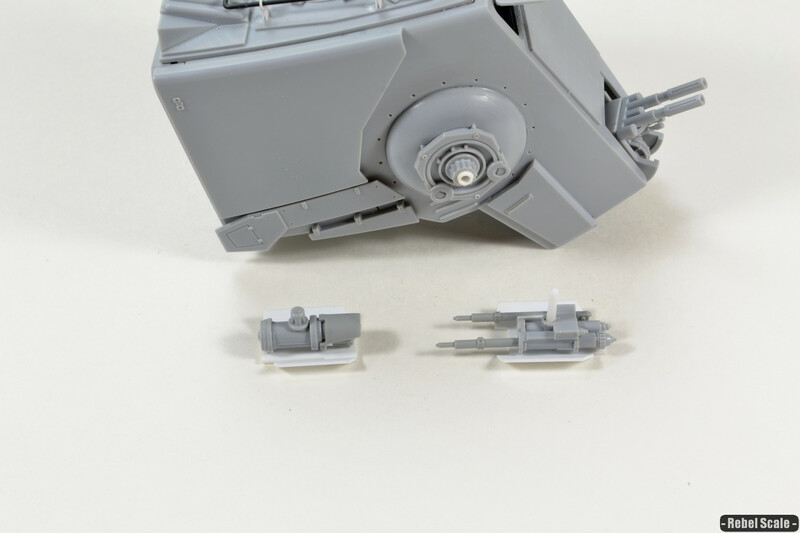 Another shot of the figure and blaster turret. You can see more of the detail there. I added a flood light to the left side of the roof complete with a clear styrene lens. I added the winch and some details to the main hull piece. Finally, I used my Xacto knife to create some battle damage similar to what was seen in the picture. The goal was to make it look jagged and/or burned, so I chipped it with the blade by literally jabbing at the model from different angles trying my best to make it look natural. I finally finished airbrushing the beast. Primarily I used Life Color Barley Grey for the base coat. I then used various other LC greys as highlights. I then took some whitish-grey to create some streaks down the side of the cabin. I'll be painting in some more modulation, but for now, the airbrushing is done. 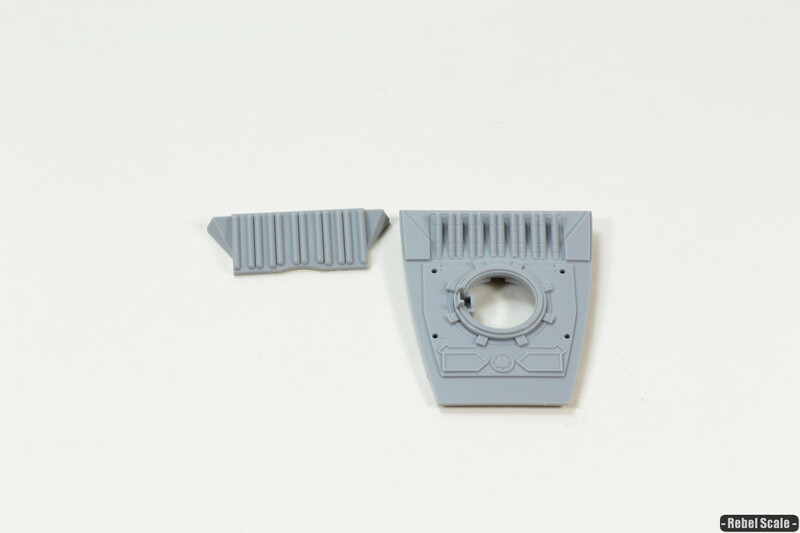 I love being able to take the model apart to paint it, but watch out for this rear piece. 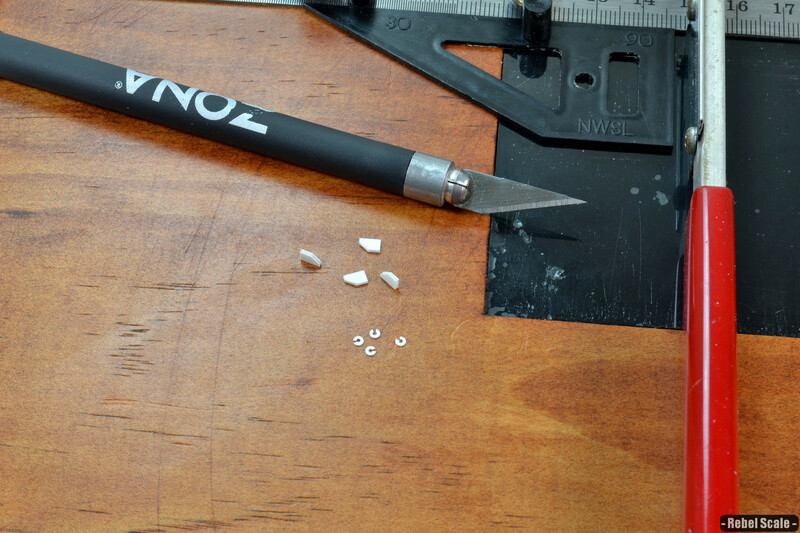 The plastic is very thin around the mounting holes, so you may need to scrape/sand the pins down slightly. I had this piece split on me, but I'll turn it into battle damage. If you want to light it, the cabin looks pretty cool with a red LED aimed toward the back of the cockpit. 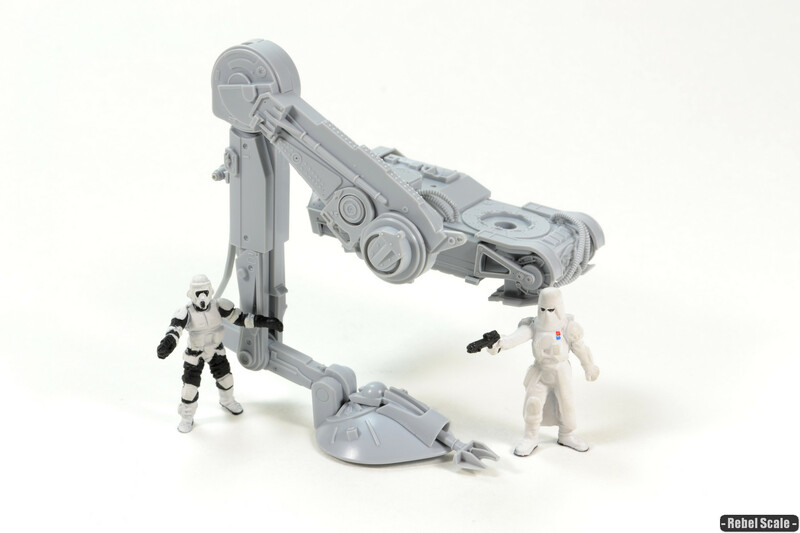 Today is a heads up for anyone building this kit. Several people have commented about enamel products attacking the model. 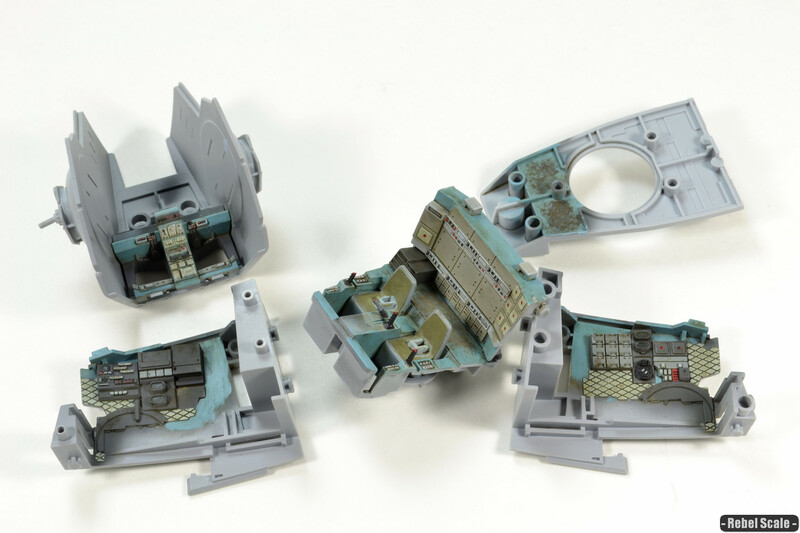 So, I applied some Mig AMMO washes (both to the outside and the inner cockpit without clear coating first) and did NOT encounter these effects on the model. Keep in mind that all of the vinyl-plastic parts were replaced except the hoses. So to test the effects of mineral/white spirits, I applied some AK thinner to the vinyl-plastic sprue of the blaster bolts. The white spirits attacked it and caused it to craze and dissolve in places. You can barely make out the part number "19" and it ate a hole in the corner. 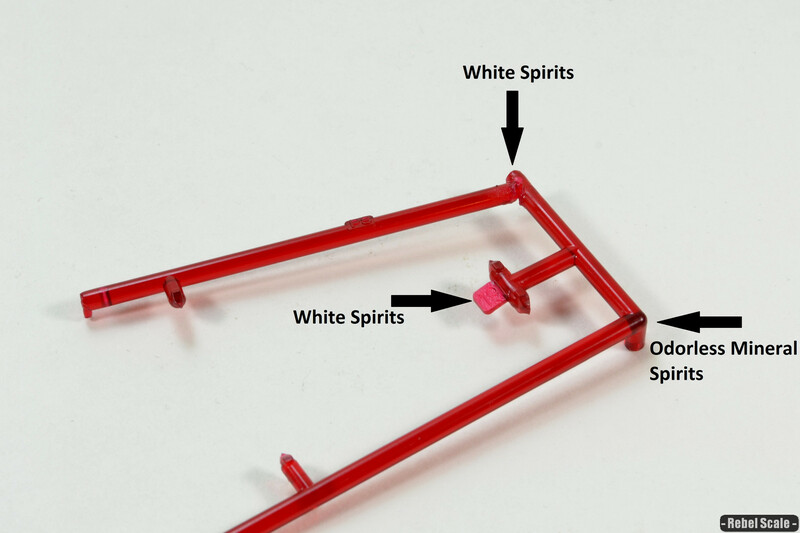 Yet, odorless mineral spirits seemed to have no effect on the plastic. I placed several drops on the underside of the hard plastic base, neither thinner affected it. Again, I had no problems applying an enamel wash to the model, but I may have gotten lucky. 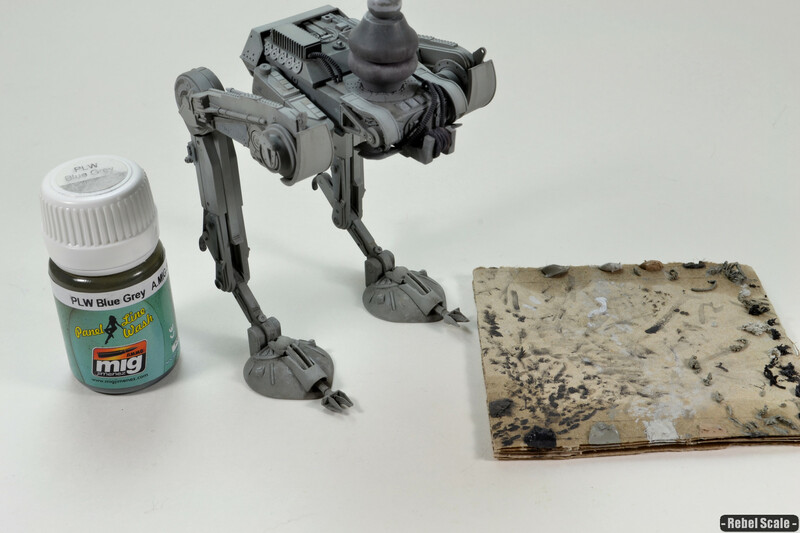 OK, so I did have some trouble using enamels on the walker. 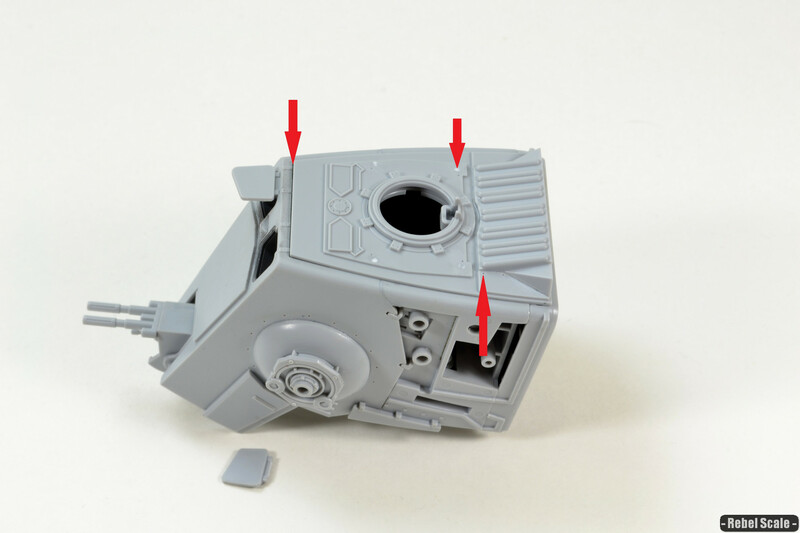 Specifically, I noticed the upper hip hinges had cracked as you can see in the picture. They didn't crack in the front, only in the back, but it loosened the tension in the joints and I ended up gluing them. I believe any time enamels/spirits pool in the joints, it can cause the plastic to stress fracture from de-gassing. HOWEVER, if you are careful in using only a little enamel at a time and only a slightly dampened thinner brush (for stumping) you shouldn't have a problem. Just don't let it pool and maybe stick to water-based washes. For the filter, I used Mig AMMO Blue-Grey wash. It is semi-mild, and I was careful to lightly apply it. I then added light grey paint chips via a sponge. I then came back with Abteilung oils to create all kinds of streaks, highlights, shadows, etc. You can see I hit some of the panels with the off-white oil to add modulation. I used the darker oils to add mud/dirt. There's even a Starship Filth color that was perfect for...well...starship filth. Then to add variation, I used the light tan to add some color in certain areas. 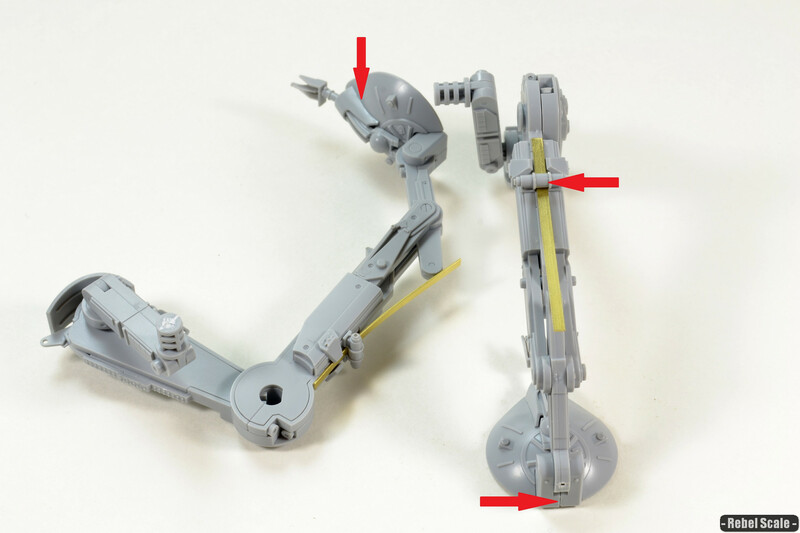 Specifically, look at the row panels on the inner hip joints and how they are different shades. More streaking on the cockpit. I painted the figures (even did the black piping on the helmets). And for the markings, I used part of the "M" on a USMC stencil, which I modified somewhat. I don't build modern armor, so I didn't mind cutting the M a little. In my mind, this is an Imperial way of counting. Each marking is a composed of 5 lines, except for the last one, which is only 3 lines. 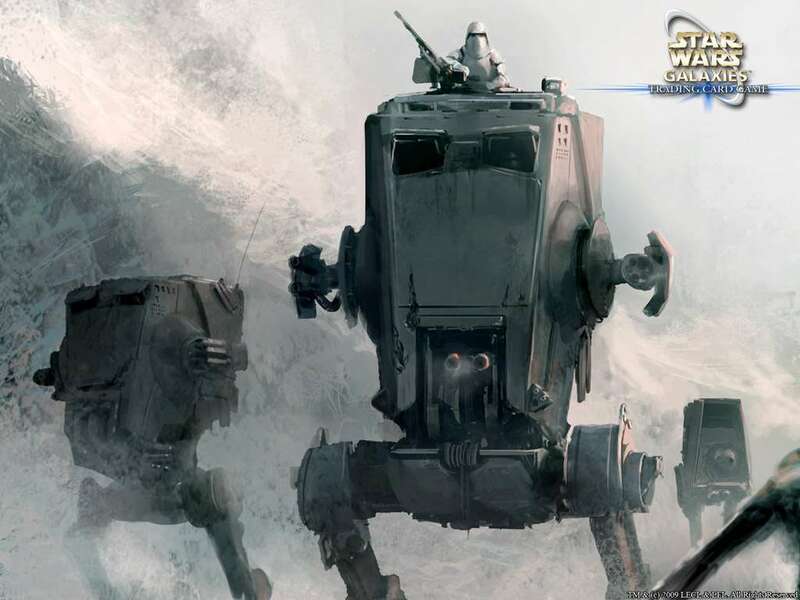 So you could say this unit has 18 kills or has gone on 18 missions...or maybe squished 18 Ewoks. Finally, I added a small decal that looks like numbers underneath. This is the weathered model from the front. After some feedback, I went back and added more weathering to the model, mostly the head. I first added more chipping using an almost-white grey via the sponge method. I then used oils to create fading, highlights, shadows, streaks, dirt, and more interesting/modulated areas. Final notes: there is a slight mold seam running horizontally across the back of the toes that I missed. 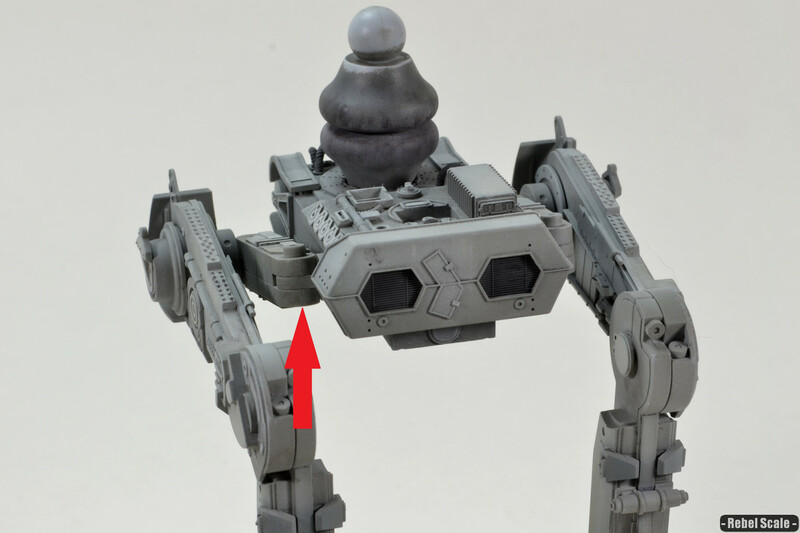 I also found that to keep the walker steady, I had to cement the joints around the tension bars. 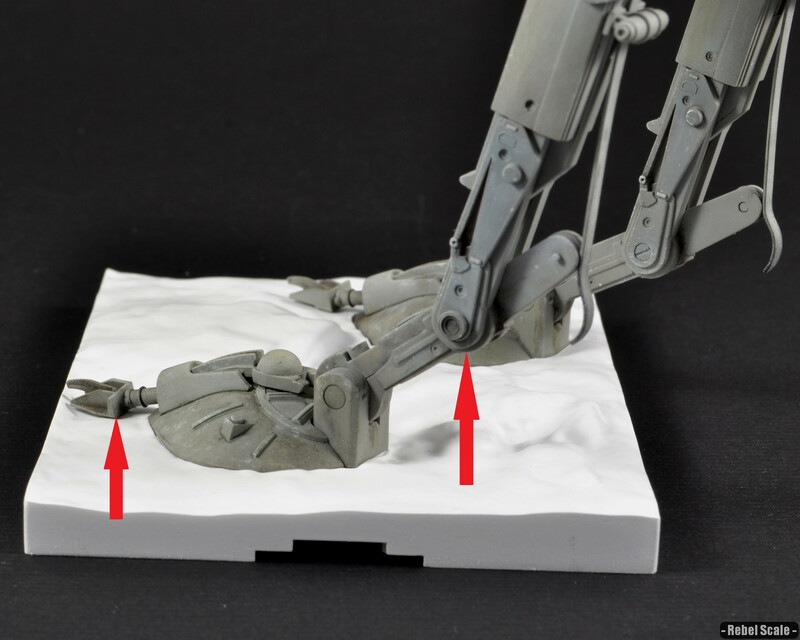 Something I recently discovered upon starting another walker is that the kit provides an optional piece that acts like a height guide to replicate the stance in the instructions. 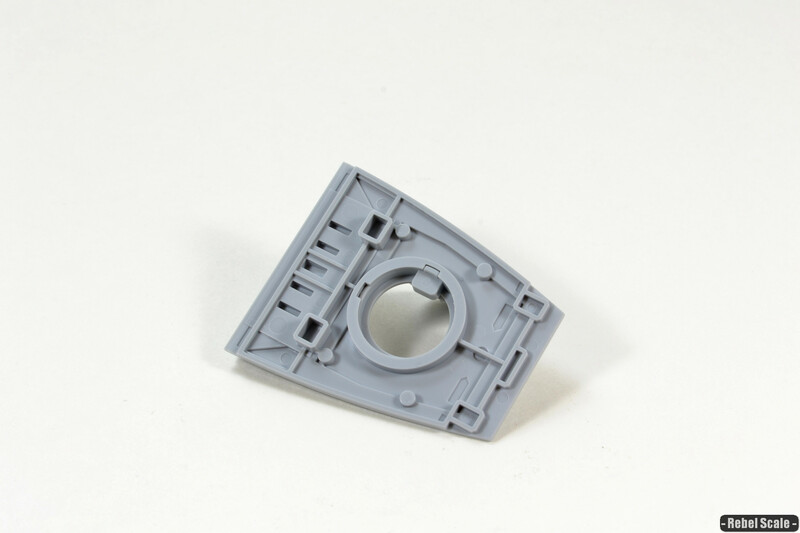 These are unmentioned in the instructions, yet the kit provides 2 of these guides, each one easily snapped off of the D sprues. They are a little loose and probably won't work as a way to hold the lower hull for painting without Blue-tack. If you don't wish to use them, cover up the underside opening with part C1 12 as per the instructions. Hello, but what is the use of Banda’ decals? Where must I put them? Thanks. They’re basically extras that you can put anywhere if you want. They are not essential. I didn’t use mine, but I kept them for other projects. Thanks man. 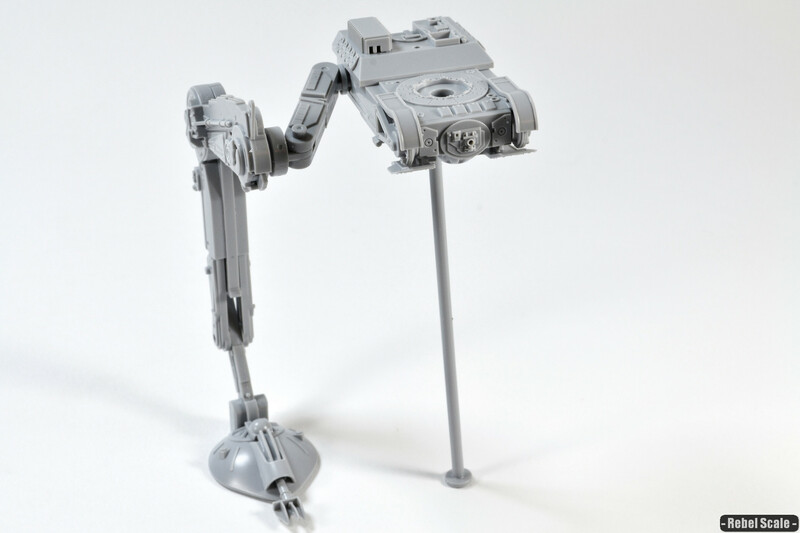 Yes, if you see the pics of the studio models (such as this one) show the tensioner bar sticking out beyond the legs. I think the curved bit is supposed to catch the legs should they extend too far. Fantastic work. I’m just getting back into modeling and started on this guy. Painting the cockpit now. What are the tricks you used to nail the piping on the pilot helmets? Toothpick? Thanks man. That’s a great kit to get back into modeling with. For the helmet, I used the side of the brush, aka the center of bristles (not the tip). Hold the brush horizontal to the piping, and gently move it around the helmet. For the silver bits, I used a silver pen. If you want to, take some pics and show off the build at Keeper of the Force, it’s a great site with great people. Your model looks great, I had two questions. What does WotC stand for?Are those mini figures accurate to the scale of the walker? Thanks man. WotC is Wizards of the Coast. They used to have the Star Wars license for role-playing games. 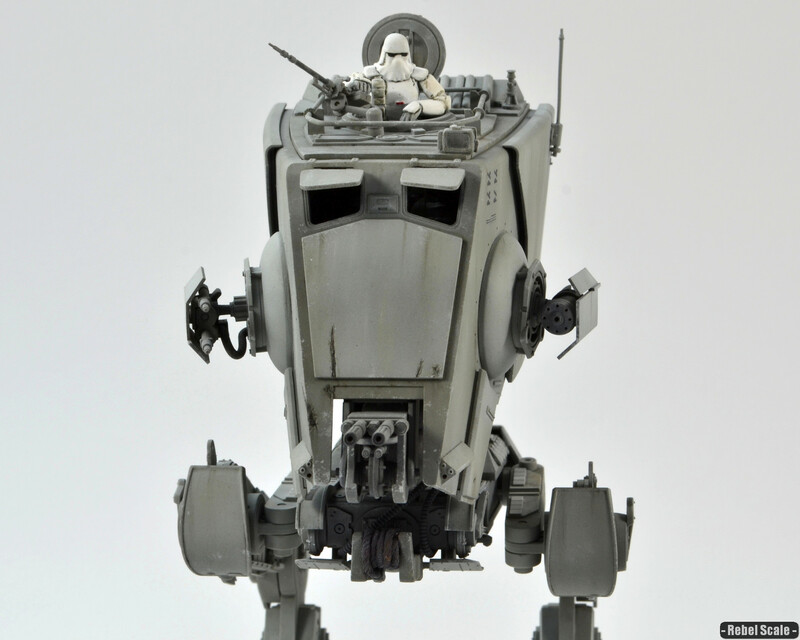 The figures they made, such as the Snowtrooper I used in this model, are almost exactly 1/48 scale, just like the walker. Fantastic build and a very detailed log of your work, fine modeling skills on the kit-bashed pieces too. 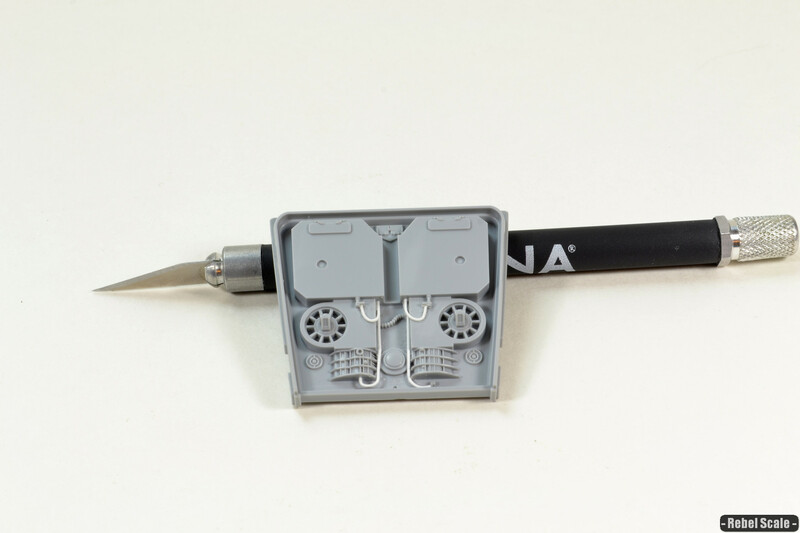 I have a couple of these kits which I’m looking forward to starting but I won’t go too much into finely detailed modification like you have and I’ll probably just build it OOB although there are a couple of things I may adapt from your build log, one of them being drilling out the rivets. 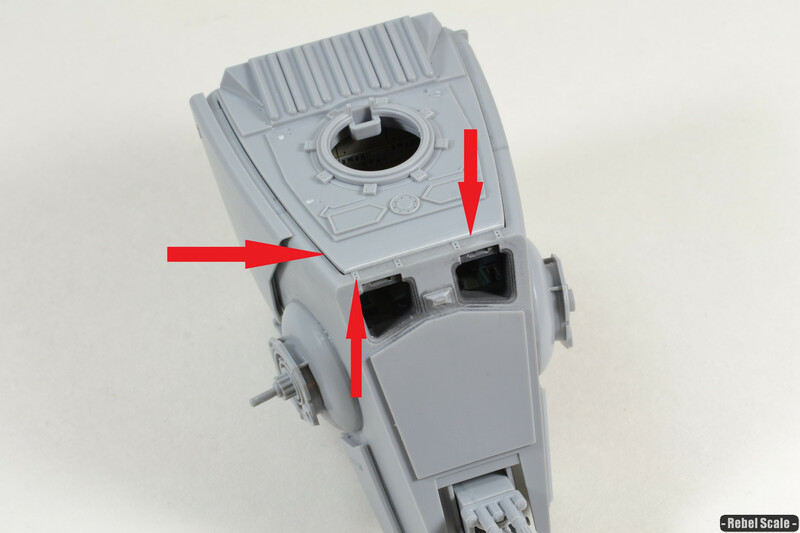 You are quite correct, drilling the rivets out makes the area’s more noticeable giving the paneling more depth, and also the shaving back of the visors for more of a half open angle. The only thing that I found strange were the points you made to remove or uncover certain parts to expose the obscured detail, but then you go and kit bash the side gun shields hiding most of their details now only viewable from the front of the model and no longer from the side, personally I would have left the shielding minimal or at stock, but do I see the concept you were aiming for, to build the Galaxies version AT-ST.
How much more articulation do the legs actually gain when removing the pins? 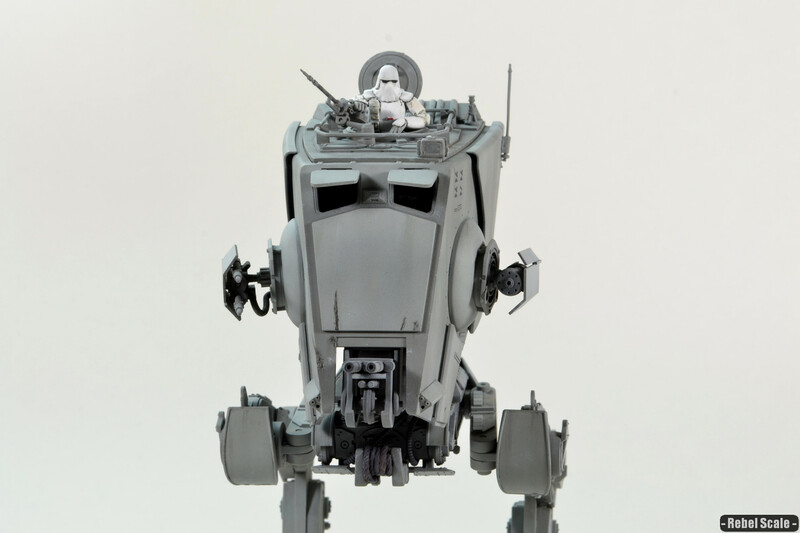 is there a huge addition in it’s height or just more bend-ability options for posing? Thank you for the comments. They are very appreciated. Regarding the gun shields/hiding detail. I was trying to copy that particular artwork on the page. You can see a large hose under the right side cannons, and I wanted to replicate that. Yeah, some stuff gets hidden, but just like the cockpit, it was still fun painting all the details. As for the articulation, you can do basic poses without removing anything. 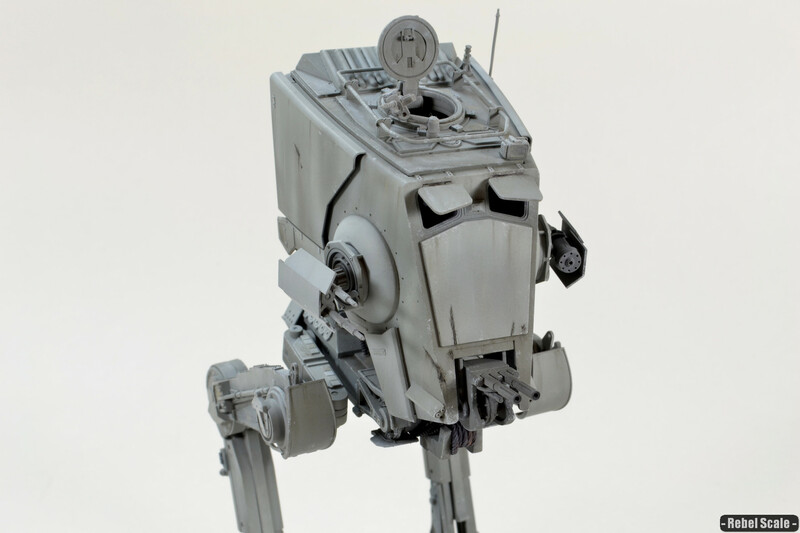 But for extreme angles, folding up legs, or for one crashed, I suggest modifying it for full articulation. You may want to see my other article on adding the leg/foot rotation to TRULY replicate what you see in the movies.